… of your nearest war-zone ambulance. “I felt the engine start, felt him climb into the front seat, felt the brake come off and the clutch go in, then we started. I lay still and let the pain ride. As the ambulance climbed along the road, it was slow in the traffic, sometimes it stopped, sometimes it backed on a turn, then finally it climbed quite fast. I felt something dripping. At first it dropped slowly and regularly, then it patterned into a strem. I shouted to the driver. He stopped the car and looked in through the hole in his seat. ‘We’re not far from the top. I wouldn’t be able to get the stretcher out alone.’ He started the car. The stream kept on. In the dark I could not see where it came from the canvas overhead. I tried to move sideways so that it did not fall on me. Where it had run down under my shirt it was warm and sticky. I was cold and my leg hurt so that it made me sick. After a while the stream from the stretcher above lessened and started to drip again and I hear and felt the canvas above me as the man on the stretcher settled more comfortably. ‘He’s dead I think,’ I said. Just look at that list. I’m not ready to say that the path of the war-time ambulance driver is a surefire path to literary greatness- but it definitely doesn’t hurt. And the resulting eminence doesn’t necessarily have to come in the world of letters. 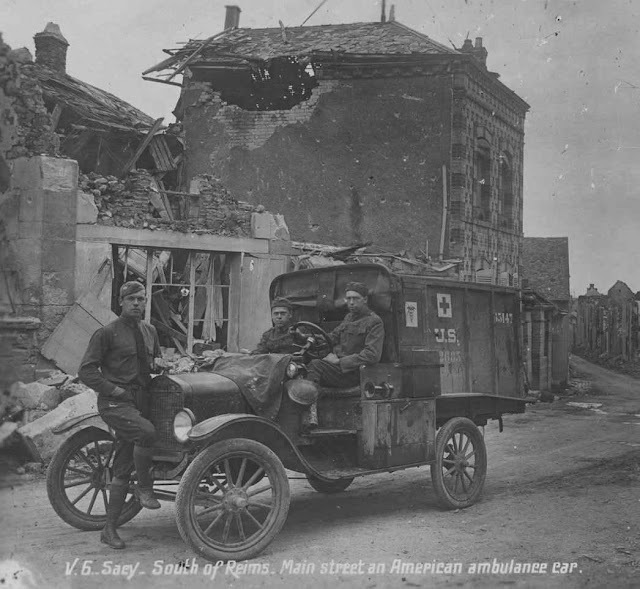 The French composer Maurice Ravel and American artist Waldo Pierce both spent formative years in the cab of a war-zone ambulance. Ray Kroc and Walt Disney were two others who drove ambulances in the Great War. Can you imagine a world without Kroc’s golden arches or Disney’s mouse ears? At some point the evidence crosses the threshold from anecdotal and coincidental to downright empirical. There’s something to all of this. But maybe being a war-zone ambulance jockey just isn’t your thing. No problem. There’s still some literary magic to be found far behind the front lines. Gertrude Stein was a driver for French hospitals. National Book Award winner AJ Cronin was a Royal Navy surgeon. Famous critic Edmund Wilson was a stretcher-bearer. And both Walt Whitman and E.M Forster made a practice of sitting with the wounded during the Civil War, and World War I, respectively. So, you wanna be a writer? Be a war-time ambulance driver. Grab your driver’s license and get your passport handy. Literary greatness awaits you. See Los Angeles! Read a Novel!